South Korean President Moon Jae-in says US President will grant North Korean leader's wishes if he delivers on denuclearization. 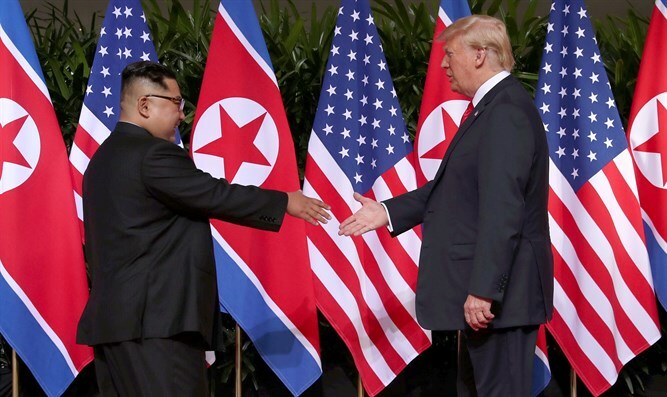 US President Donald Trump will grant North Korea's leader Kim Jong Un his wishes if he delivers on denuclearization, South Korean President Moon Jae-in said Sunday, according to AFP. Moon relayed a message to reporters given to him by the US president to pass on to the North's leader. "And the message was that President Trump has a very friendly view of Chairman Kim and that he likes him, and so he wishes Chairman Kim would implement the rest of their agreement and that he would make what Chairman Kim wants come true," Moon was quoted as having told the Yonhap news agency while en route to New Zealand from the G20 summit. The South Korean President’s comments came hours after Trump said he hoped to organize a follow-up meeting with Kim for early 2019. "We're getting along very well. We have a good relationship," he said. Asked if he would ever host the North Korean leader in the United States, Trump replied, "At some point, yeah." Last month it was reported that Kim had inspected the site for testing a “newly developed cutting-edge strategic weapon”. A subsequent report, however, suggested that Kim is willing to allow inspectors into the country's main nuclear complex in Yongbyon. US officials insist on the complete, verified and irreversible denuclearization of the Korean peninsula before sanctions are lifted. North Korea, meanwhile, has rejected demands for what it calls "unilateral" disarmament, and has instead sought unspecified reciprocal US measures in a gradual process.